These two new books are perfect for anyone looking to take a closer look at the "Star Wars" universe. If you can't wait for the next installment of the "Star Wars" franchise, two new books are sure to satisfy your longing for a galaxy far, far away. 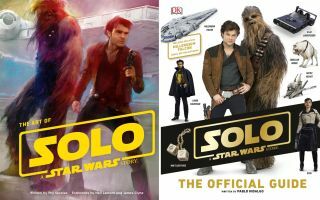 "Solo: A Star Wars Story The Official Guide" leads readers through every detail of Lucasfilm's latest release, including technical aspects of different ships and characters. You can explore everything from the ins and outs of the Millennium Falcon to the inspiration behind the different aspects of characters' outfits. Want to know what material Han Solo's jacket is made from? Or would you like to learn the story behind Han's lucky dice? Maybe you're curious about what outerwear and gear is necessary to survive on the snow-covered world of Vandor. This book doesn't miss a single detail. "The Art of Solo: A Star Wars Story" takes you through the captivating design process of the movie. The book includes sketches, storyboards, production paintings and more. All you might need to know about Enfys Nest's gang. The other book, "The Art of Solo: A Star Wars Story," explores the design evolution of the new film. With everything from photographs to sketches, storyboards, production paintings and early visual concepts, this book is stunning to flip through. Even those who don't follow the franchise closely can enjoy this book. You don't need to have an encyclopedic knowledge of the series to appreciate and enjoy the beautiful images behind the epic new film. Early concept and character art shows original designs for the film. A stunning artistic portrayal of the Millennium Falcon.